Cryptocurrency is the new Wild West Gold Rush, and it’s not slowing down anytime soon.Whether you’re mining Doge coins or need a digital wallet, there are apps worthy of consideration. And as Cryptocurrency like Bitcoin gains popularity in the real world, having apps to handle or spend your coins is becoming more and more important. In fact, 2018 will be a big year for Crypto. Being able to pay for real-world goods and services is only going to expand. As a result, you’ll want to have a firm handle on everything crypto related. There are apps for mining coins, tracking cryptocurrency apps and apps for storing your bitcoins, Doge coins and all other forms of digital currency. And just like investing in the stock market, real-time information is key in investing in cryptocurrency - awareness of the various currencies' prices on many exchanges is crucial for making informed decisions, whether day trading or holding long. 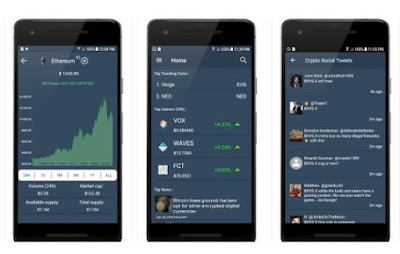 Realizing this, app developers have responded accordingly - and here is the app we found is one of the best to keep you up to date on the crypto-markets - Coinalysis! Coinalysis is a cryptocurrencies tracker app that can track, analyze and convert all of the crypto coins you are interested in. Whether you want to track bitcoin or other coins rates, convert their rates, get real-time news and information about more than 2000 cryptocurrencies, Coinalysis will be the right choice for you. This app will serve you many purposes, as it’s one of the most versatile crypto app on the market. Other than its main purpose of tracking, analyzing and converting cryptocurrencies and their rates, the app comes with many other unique features perfect for every crypto enthusiast. Coinalysis will provide you with the latest trending news related to all cryptocurrencies all sorted by coin, popularity, published date and relevance, making it easy and convenient for viewing. It also have social media integration with StockTwits for engagement with others about everything related to trending coins. The app provides information about over 1000 cryptocurrencies, from Bitcoins to DigixDao and everything in between. With Coinalysis you get detailed coin view for all those crypto coins with real-time and historical price data tracking, market capitalization per coin, market dominance, trading volume and more. The Coinalysis currency converter can convert between cryptocurrencies and currencies. It supports USD, BTC, ETH, EUR, British Pound, INR, KES and 10 more currencies. You can find and download the Coinalysis app at the iTunes App Store or Google Play Store free.